MaxxTraxx is an automotive business management software that helps users to increase their bottom line by enabling them to take informed business decisions. It is a tool that integrates service writing, marketing, parts ordering, and inventory management. It is offered as on premise and web based software. MaxxTraxx comprises of three primary departments: Service, Parts and Business Management. The service department module offers features such as appointment control, progress tracking, repair order and price quotes. These features help users capitalize on sales opportunities by identifying and targeting the right set of consumers. The parts department module helps users optimizes their inventory by tracking and managing parts and supplies. Users can also connect with major parts and labor databases which helps them choose the right distributors for ordering their component supplies. Business management department controls all the financial transactions such as sales reports, accounts payables, account receivables, check writing, banking and payroll. This product has an integrated ledger to maintain financial statements. This functionality provides a financial overview of the business and maximizes profitability. This product also provides QuickBooks integration, customer retention tools, and marketing management. The company Scott Systems which is the vendor of MaxxTraxx provides an extensive support for the product both online and over phone. Maxxtraxx caters to small, medium, and large automotive repair shops. I have work with Scott Systems since the DOS days. I have grown my company with them. Personal help.The support team is second to none. They take suggestions and make it happen.They are just like family and work with my business. I never have to worry about lost data or down systems. I have changed my computer systems and network in the may years I have been with them. I currently have VMware that is a virtual network that I implemented 5 years ago. Scott Systems was there with me to make it happen. If you are looking for a company that has your back and cares about your business as much as you do you have found the place. The support team is second to none. They take suggestions and make it happen.They are just like family and work with my business. I never have to worry about lost data or down systems. I have changed my computer systems and network in the may years I have been with them. I currently have VMware that is a virtual network that I implemented 5 years ago. Scott Systems was there with me to make it happen. If you are looking for a company that has your back and cares about your business as much as you do you have found the place. Nothing. Scott Systems is a great company to make your shop the best it can be. SQL based, rock solid performance, networks well. Intelligently designed and works well in our RV shop environment. The parts ability has given us much greater control over our parts prices and purchasing. Takes a little to get used to and set-up the way you want but well worth the time and investment. Could stand to have some more customizing options, it has a lot already for an SQL based app but it needs a few more. Added features take time to get in the program if they actually do. Thanks for the nice review Kevin. We are working each day on ways to make the program better. If you have specific feature requests, please contact our Support Department or submit a Feature Request Ticket from the Help Menu in MaxxTraxx. As you may know, most major Feature Requests go to the Voting Board for all of our users to vote for while minor ones that we think will have value for the majority of our users are handled as soon as possible . We do our very best to add worthwhile new things while always trying to minimize program bloat. Please feel free to contact me anytime. We have used MaxxTraxx for 13 years in shop and have found it to be a great program overallI like the features of the program. There are too many to list here but it's a robust program sufficient for any automotive shop. I like the features of the program. There are too many to list here but it's a robust program sufficient for any automotive shop. Slow to adopt new technologies as they become available. Hello Nick. First and foremost, thank you for trusting us with your business since 2005. We are constantly adding to the program but we know it is never fast enough. I'll call you so we can go over any new tech that is of interest to you. It changes everyday as you know. IN ORDER FOR YOU TO KNOW IF AN AUTO SOFTWARE IS GOOD, YOU SHOULD HAVE TRIED SOME PROGRAMS TO KNOW THE GOOD FROM THE BAD. OVER THE LAST 20 YEARS I'VE USED AT LEAST 10. MAXX TRAXX IS THE BEST BY FAR.EASE OF USE. THIS PROGRAM CAN BE USED TO WHAT EVER LEVEL YOU WANT. TECH SUPPORT IS GREAT. PRICE IS VERY REASONABLE. EASE OF USE. THIS PROGRAM CAN BE USED TO WHAT EVER LEVEL YOU WANT. TECH SUPPORT IS GREAT. PRICE IS VERY REASONABLE. THE ONLY CON YOU'LL GET IS THE COMPANY CALLING YOU TO SEE HOW YOU ARE COMING ALONG. THAT'S THE BEST CON TO HAVE. The registration fee is waived off for the existing Scott Systems users. MaxxTraxx Pro features “Service Counter” which helps users manage appointments, schedule jobs and track progress, quotes and profitability. The “Parts Counter” features helps users to track part sales and customer purchase history. The software enables parts management by controlling inventory, prices, purchase orders, and invoice tracking. MaxxTraxx allows users to generate customized reports such as daily sales and employee productivity reports. The software allows users to track financial statements, accounts payables and receivables and also check writing, banking and payroll. MaxxTraxx integrates with QuickBooks meaning the two products can be used alongside each other. 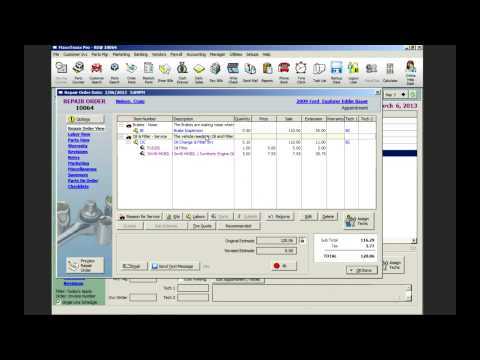 Users can export details to QuickBooks. Below are some frequently asked questions for MaxxTraxx Pro. Q. What type of pricing plans does MaxxTraxx Pro offer? Q. Who are the typical users of MaxxTraxx Pro? Q. What languages does MaxxTraxx Pro support? Q. Does MaxxTraxx Pro support mobile devices? Q. Does MaxxTraxx Pro offer an API? Yes, MaxxTraxx Pro has an API available for use. Q. What other apps does MaxxTraxx Pro integrate with? Q. What level of support does MaxxTraxx Pro offer? Q. Which apps is MaxxTraxx Pro compared to most often?